Tales of the Elsmo Four: Treasured. 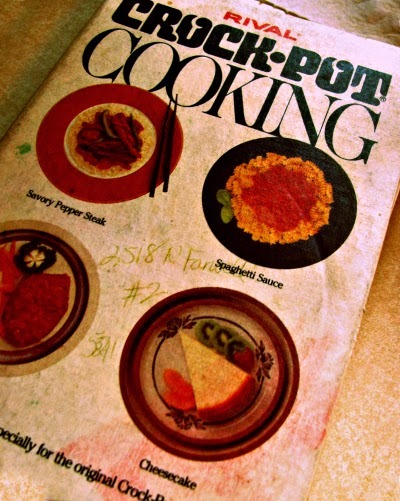 Published in 1975, Rival Crock Pot Cooking was the very first cookbook I ever used on a regular basis. I didn't use it because of any insane passion for crock pot cookery, but out of sheer financial desperation. I was teaching ballroom dance at the time and only made $150 per week. I had my own apartment and could barely afford my rent. Turning on the gas was not an option for me; if I had used the stove even once I wouldn't have been able to pay the bill because I didn't have any expendable income. Electric was included in my rent and I decided to get by cooking all my meals with a toaster, microwave and crock pot. And then I met Leif. I wooed him with stringy lemon chicken from my slow cooker and other trusted Rival recipes. If you look closely you can even see the address to Leif's apartment scratched on the cover of the book. I came across the book while I was cleaning out my cookbook cabinet and I realized just how special it was. The desperation of those times seems so lovely to me now...adulthood and love were new and alive in my life in a new and exciting way. I could never have imagined how entangled my life would become with the boy who lived at 2518 N Farwell and how much cooking a crock pot dinner for him and our two children sixteen years later would mean to me. I have a treasure of a book and a treasure of a life. 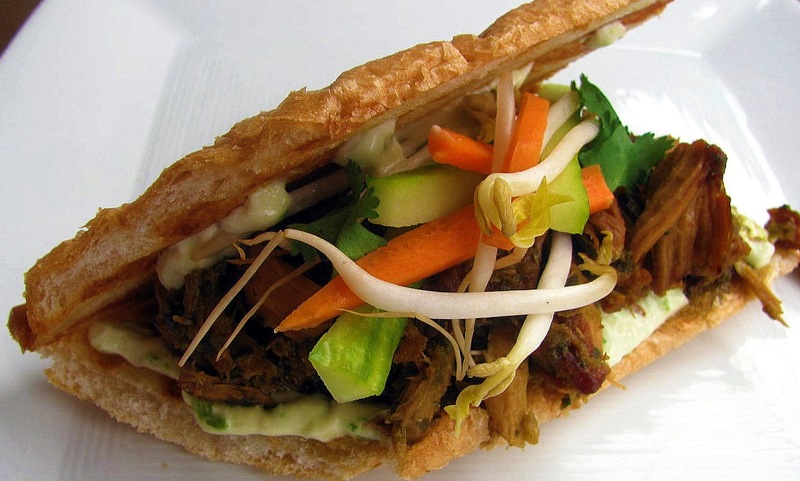 French Vietnamese Bahn Mi Sandwiches with Mung Bean, Carrot, Cucumber, Cilantro, and jalapeno aioli. Combine all ingredients in the food processor and pulse until smooth. I didn't wipe it out after processing the paste for the pork...I think it added some great flavor. Cut each baguette on the bias into 4 equal sections and cut nearly in half leaving a hinge. Drizzle with olive oil and grill or toast until golden. Rub the toasted bread with the cut garlic. Top with 1/2 C pork, desired veggies, and some jalapeno mayo. What a sweet little tidbit! Just out of curiosity, have you ever made the cheesecake? There are sooo many little tidbits in here that I wish you would have told me last night!!! First - you taught ballroom?! Huh? How do I not know this little secret about you? What did you teach? Do you still dance? Second - it's absolutely precious that this book has Leif's apt. address scribbled on it! You should frame the cover (if that's a paper sleeve, I see). If it is, I can lend you an archival mist to spray on it so it neutralizes the acidity of the paper and prevents it from falling apart years later!). And my love hate relationship with the crock pot continues...apparently I cannot make the cheesecake without some Rival cake bake pan cira 1970 and I don't have one. Nubia-I taught and competed on the professional ballroom circuit for about a year before Leif whisked me away to Chicago. I taught all dances at an entry level, but competed in American Smooth: Viennese Waltz, Waltz, Fox Trot, and Tango. I also did a bit of theater arts. I didn't get too far into the whole thing because it was a brief part of my life. Do you watch So You Think You Can Dance...Jean Marc Genereux & France Mousseau used to stop by all the time. Funny!! Do you need photo evidence? the photo evidence is unbelievable. I would have paid you to teach me to look like that! Look at the power radiating from your legs...just pure passion/conviction. It's a beautiful picture. It's so amazing to see where kids get part of their talents. I'm really just in awe as I look at this picture...stunning!!!!!!!!!! !